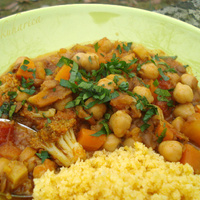 Tasty, flavorful stew ideal for UN dieters and vegetarians. Heat oil in large saucepan over medium-high heat, add onion and cook for about 3 minutes. Add celery, carrot and broccoli to pan and sauté for about 5 minutes. Add in all seasonings and cook additional 1 minute. Add water, tomato paste, chickpeas and lentils, bring to a boil. Cover, reduce heat to low and simmer for 20 minutes. Meanwhile, cook couscous in separate pan according to package directions. 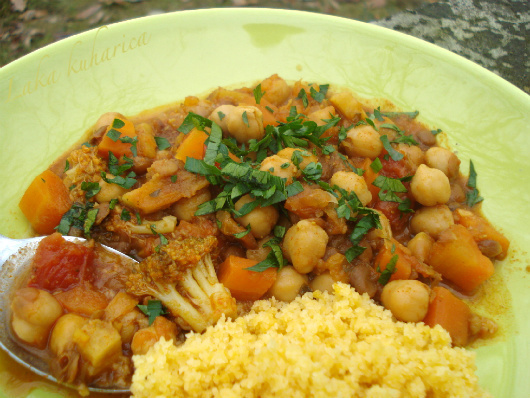 Add cilantro and lemon juice to stew and serve over warm couscous.